All of the procedures that you have been settling with Euskoiker using handwritten signatures may also be carried out using an electronic signature. You may continue to hand-sign documents, but now you will also have the option of signing them electronically. When we refer to an electronic signature, we do not mean scanning signatures and attaching these to documents. This is not a legally valid practice. Electronic signatures require a card with digital certification. However, the system is quick and easy and saves time and paper. In the past you may have had problems with using a digital signature because the first applications that were created by different administrations tended not to be very user-friendly. However, digitally signing a document is now an extremely simple process which can be completed in seconds. This saves having to use a scanner to digitalise documents and then having to resend original documents by snail mail. Electronic signatures have the same legal validity as hand-written signatures but are far more convenient, especially when, for example, several people that are working on the same project but based in different headquarters or regions (or even countries) have to sign the same contract, offer or payment order. Whether it is for questions of ecology, comfort, savings or security, there are many reasons to move on to using digital signatures. In any case, this change is for the better. Euskoiker will adapt to suit your requirements, enabling you to use hand signatures or electronic signatures depending on your circumstances at the time. If you do not have access to a device or it is not convenient to you, you can continue to sign documents as you have been doing up until now. If you are already involved with knowledge transfer projects with Euskoiker, you will soon receive an email asking you if you would like to be offered this new signature option starting from 2018. What do you need to use an electronic signature? UPV/EHU lecturer cards contain an Izenpe digital certificate which allows you to sign electronically. The same certificate that you may already be using to sign your course proceedings also enables you to sign other types of documents. However, Izenpe certificates expire four years after they are issued, which means that if you have had your card for more than four years you may need to request a new one from the secretariat of your centre. In addition to this, when you were issued with the card you will have been given a series of passwords, including the password of the card. This password can be changed but if you have not done so, it will continue to be the same one that came with the card documentation. It is important that you know what your password is because you will need it to sign digitally. All of the UPV/EHU corporate computers bought under the terms of current purchase regulations have this SmartCard reader (apart from Apple computers, which cannot be modified). In any case, if your computer does not have this device, you can install one externally. If you do not have a SmartCard reader or you are not sure whether you have one, contact CIDIR about how to get one as you will also need it to digitally sign proceedings. The card reader may require specific software, which CIDIR will also help you to install if you ask them to set you up for digitally signing proceedings. Once you are able to sign notes digitally, you will also be able to sign other documents with an electronic signature because they all require the same set-up. In any event, you can also install the electronic signature systems on your personal computer. Izenpe’s website has instructions for installing certificates. In Windows you can do it by downloading a single installation file, while in Mac OS you will have to download 3 separate files (an executable installation file and two applications that you will have to drag to the respective folder) and reboot the computer after installing them (all before connecting the reader). There is also a list of recommended card readers for Windows and Mac OS. In any case, to be sure, it is best to buy the reader directly from Izenpe (it costs around 10 euros). 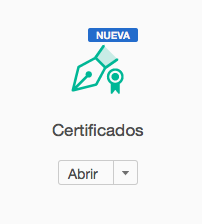 This is the logo of the tool to sign using digital certificates in Acrobat Reader. This is the easiest programme to use when signing documents. It is normally installed on your computer by default but if this is not the case you can ask IT technicians to install it for you. Once you receive a PDF to sign, all you have to do is open it in Acrobat Reader and attach your electronic signature. The exact action depends on the version of the programme that you have on your computer but you can normally find it on Fill and sign / Work with certificates / Sign with certificate or in Tools / Certificates / Sign digitally. From then on, you will see a series of dialogue boxes which will ask you to indicate the part of the document in which you want your signature to appear. Drag the cursor to mark a rectangular section in which you wish to place your signature. Next, you can select which certificate you would like to use to sign (if you have more than one) and you will then be asked for the password of your card. 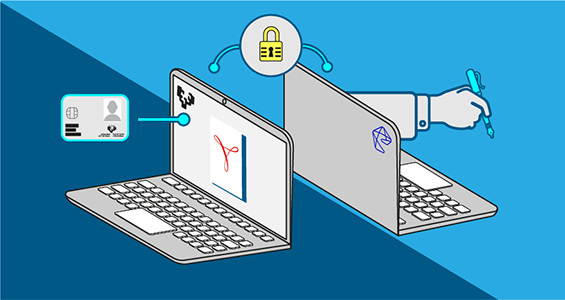 At the end of the process, Acrobat Reader attaches your signature, which normally carries various pieces of information about you (name, date of signature, national identity document number and so on) plus an alphanumeric code. The PDF document can then be sent to the recipient, already signed and with full legal validity. When can I use electronic signatures? The main researcher sends Euskoiker a very basic abstract describing the project that he or she wants to set up. In this case, a signature is not required. Depending on the quantity, the project will begin to be processed with a company offer (for projects of up to €9000 plus VAT) or a contract (for values of greater than €9000 plus VAT). In the former situation (when an offer is involved), the company can sign this, if they wish to, with an electronic signature, in the same way that the lecturer can electronically sign the contract that Euskoiker sends a posteriori. In the latter situation (when a contract is involved), any of the parties may sign electronically. Although ideally all parties would sign in the same way, this is not necessary, meaning that the choice of one of the parties will never determine the choices of the others. As always, Euskoiker will prepare the documentation and ensure that all parties sign this, making the procedure easier for the UPV/EHU researcher. In addition to these documents, with all projects processed a compliance document must be signed by the director of the different participating departments and by the researchers on the project. This document will outline the time commitment and emoluments of each researcher. Again, this document can be signed electronically, which is especially helpful if the signatories work in different centres. Lastly, after the processing stage, the lead researcher must authorise the different expenses, which includes signing each invoice paid with project funds, authorising payroll payments using the appropriate form and so on. Until now, this process had been completed using hand-written signatures which would be scanned and then sent by snail mail. Given that many signatures may be involved, lead researchers with access to electronic signing can save themselves a lot of time and effort. This means that it is advisable, particularly for lead researchers in these kinds of projects, to check that the following three elements that are required for digital signing are available and up to date: a card with a digital certificate, a computer with a card reader and a programme which is capable of working with these signatures, such as Acrobat Reader. What is the benefit of contracting projects with companies?